Yalta - the most popular resort of Crimea known all over the world. This resort city with its climatic and landscape conditions, with well developed show business, as well as possible promotes rest, restoration of forces and health of the person. Today's Yalta are picturesque twisting small streets and new quarters of skyscrapers, ancient parks and the snow-white yachts moored directly at quay of a city - a favourite place of walks having a rest and jaltintsev. Sanatorium "Zaporozhye" is one of places in a city where you can have a rest and restore the health. 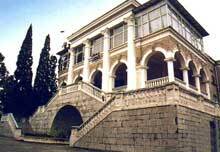 The sanatorium is located in city centre Yalta, in a park zone, in 10 minutes of walking from the sea. sanatorium Specialization: diseases of kidneys (chronic glomerulonefrit), diseases of sordechno-vascular system and the top respiratory ways. Placing: the five-floor sleeping case, 2 local numbers with all to conveniences (a shower, a toilet, a washstand). In all numbers TVs (satellite TV about twenty channels) and refrigerators are established. All numbers have balconies. a Food: 3 the single, custom-made menu, all kinds of diets, service by waiters. Water supply: cold water constantly, hot - all light day. Medical base: physiotherapeutic, stomatologic, procedural offices; ingaljatory, offices of medical massage, hall LFK with training apparatus; balneoprotsedury (a bath, medical souls); the pool which is in obshchekurortnoj to a balneary. Diagnostic base: clinical, biochemical, bacteriological researches; functional diagnostics: an electrocardiogram, veloergometrija, reovazografija, klino - and ortostaticheskie tests. In sanatorium the method of treatment chronic glomerulonefrita aerogipertermicheskimi by baths (AGTV) in conditions klimatotrona in which key parametres of a known resort of Bajram-Ali are modelled is used original, not having analogues. The highly skilled medical personnel Works, you can receive consultations of the neuropathologist, the urologist, the surgeon, funktsionalista. At your service: a sports hall, a tennis court, hire of sport stock and beach accessories, long-distance phone, the organisation of excursion service, walks on the yacht, speleoturov. Near to sanatorium there is A.P.Chehova's House museum, N.Z.Birjukova's House museum, St. Feodor Tirona's church, a zoo "Glade of fairy tales"
the Beach: arranged well medical where the sports hall with training apparatus, boat station, a first-aid post, point of hire of sports and beach stock, and also a bar works. the Checkout time - 8.00. At settlement it is necessary to have the passport, a sanatorium card and the permit or the voucher of sending firm on hands. On children the birth certificate and the inquiry, about epidokruzhenii. The Schedule of arrivals in May, in first half of June and September - can be free, as agreed. the Discount for the children's permit till 16 years makes - 10% from a permit overall cost, children take places on the basic berth. the Discount for the children's permit till 11 years makes - 50% from a permit overall cost, children take places on an additional berth. the Discount for the children's permit with 11 till 16 years makes - 30% from a permit overall cost, children take places on an additional berth. the Address: Yalta, street of Lomonosov, 29, sanatorium "Zaporozhye"